Newton Upper Falls is a village of Newton, rich in history. The first mill was created on the Charles River in 1688 and over the next 150 years the village boomed. By then, it was the most populous village in Newton. The history is evident in the beautiful stone mill buildings, houses of worship, and other historic buildings that have survived from that era. A great number of Newton Upper Falls homes from the 1800s have been preserved and are protected by the Historic Commission. This area is super convenient for commuters. The property is .75 miles to the Eliot T-Stop (the D Line) and it is an easy hop onto Route 9 and 128. Just down the street are shops, restaurants, pubs, a nursery school and parks. This village has a great deal of pretty green spaces as well. Notable Information Courtesy of Neighborhood Scout and the City-Data. Newton Upper Falls neighborhood has more Russian and Lithuanian ancestry people living in it than nearly any neighborhood in America. In fact, 5.6% of this neighborhood’s residents have Russian ancestry and 1.4% have Lithuanian ancestry. Newton Upper Falls is also pretty special linguistically. Significantly, 5.8% of its residents five years old and above primarily speak Korean at home. While this may seem like a small percentage, it is higher than 99.1% of the neighborhoods in America. If knowledge is power, then imagine the cumulative power of one neighborhood where many of the adults have earned an advanced degree, such as a Masters, law degree, medical degree, or even a Ph.D. This is certainly the case in the Newton Upper Falls neighborhood, where 37.4% have earned an advanced degree. Compare that to the average neighborhood in America, where just 8.4% of adults have completed a post-graduate degree, and you can see why this neighborhood is a stand out. In fact, this neighborhood has a higher rate of adults with an advanced degree than 97.5% of the neighborhoods in America. In addition, think about the people you know personally. How many of them would purchase box seats to opening night at the symphony? How many of them regularly attend gallery openings, or are the first to reserve tickets to opening night at the ballet? If they’re like most of us, they don’t do any of these things. But if you’re among an exclusive crowd of wealthy and refined patrons of the arts, then you’ll feel right at home in the Newton Upper Falls neighborhood: a neighborhood in which more “urban sophisticates” live than 96.6% of neighborhoods across the U.S. Here, your neighbors are defined as having urbane tastes in literature, music, live theatre and the arts. They are wealthy, educated, travel in style, and live a big city lifestyle whether or not they live in or near a big city. In addition to being an excellent choice for urban sophisticates, this neighborhood is also a very good choice for active retirees and highly educated executives. Executives, managers and professionals make up 65.6% of the workforce in the Newton Upper Falls neighborhood which, according to NeighborhoodScout’s exclusive analysis, is a higher proportion of such high-level people than is found in 96.2% of the neighborhoods in America. For this reason, this neighborhood really stands out as unique. The neighbors in the Newton Upper Falls neighborhood in Newton are wealthy, making it among the 15% highest income neighborhoods in America. NeighborhoodScout’s exclusive analysis reveals that this neighborhood has a higher income than 86.5% of the neighborhoods in America. In addition, 15.3% of the children seventeen and under living in this neighborhood are living below the federal poverty line, which is a lower rate of childhood poverty than is found in 52.3% of America’s neighborhoods. The old saying “you are what you eat” is true. But it is also true that you are what you do for a living. The types of occupations your neighbors have shape their character, and together as a group, their collective occupations shape the culture of a place. In the Newton Upper Falls neighborhood, 65.6% of the working population is employed in executive, management, and professional occupations. The second most important occupational group in this neighborhood is sales and service jobs, from major sales accounts, to working in fast food restaurants, with 19.1% of the residents employed. Other residents here are employed in clerical, assistant, and tech support occupations (9.2%), and 6.0% in manufacturing and laborer occupations. In the Newton Upper Falls neighborhood in Newton, MA, residents most commonly identify their ethnicity or ancestry as Asian (23.3%). There are also a number of people of Irish ancestry (16.5%), and residents who report German roots (8.4%), and some of the residents are also of Italian ancestry (8.1%), along with some English ancestry residents (7.1%), among others. In addition, 35.7% of the residents of this neighborhood were born in another country. The languages spoken by people in this neighborhood are diverse. These are tabulated as the languages people preferentially speak when they are at home with their families. The most common language spoken in the Newton Upper Falls neighborhood is English, spoken by 65.0% of households. Other important languages spoken here include Chinese, Korean, Spanish and Russian. Even if your neighborhood is walkable, you may still have to drive to your place of work. Some neighborhoods are located where many can get to work in just a few minutes, while others are located such that most residents have a long and arduous commute. The greatest number of commuters in Newton Upper Falls neighborhood spend between 45 minutes and one hour commuting one-way to work (26.5% of working residents), longer and tougher than most commutes in America. Here most residents (71.8%) drive alone in a private automobile to get to work. In addition, quite a number also take the train to get to work (7.3%) . In a neighborhood like this, as in most of the nation, many residents find owning a car useful for getting to work. 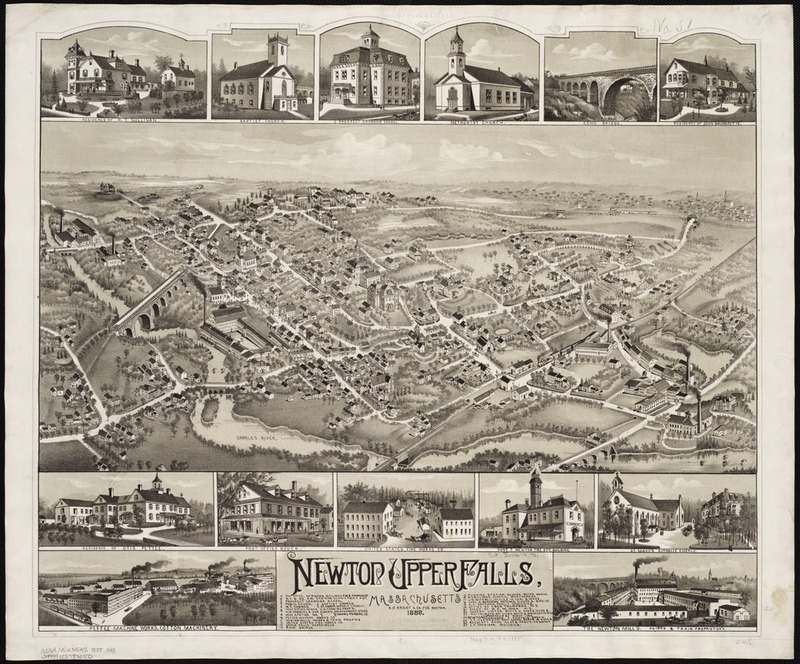 For more information on Newton Upper Falls, check out the Resources list. If you have questions not answered here, just ask!